Adjacent Pézenas, with its sprawling, very French Saturday outdoor market; five minutes away by car. This bustling marché features scores of vendors, selling everything from rapture-inducing farm-made cheeses to oysters harvested that morning to fresh Italian pasta to good gifts for the folks back home to local fruits and veggies to roasted chickens and Vietnamese take-away to well-designed, inexpensive jewelry to the globe-trotting vanilla guy to the Irish lady's ginger syrup to cut flowers to cheap clothes ... on and on and on, often with live music to boot. Pézenas is also one of the antiquing centers of Europe, with something like 50 dealers. Though little known by Americans, the Brits have adored Pézenas since the 1700s and escape here for the sun. You'll hear plenty of English spoken. The old town looks like a movie set, with cobbled, twisting streets and grand Renaissance town houses. Like culture? Love shopping? Want to linger over drinks at a café? Welcome to Pézenas! History stretching back thousands of years. Nine of France’s 41 UNESCO World Heritage Sites are an easy day trip away: from the 32,000-year-old masterpiece cave paintings of Chauvet ... to the 14th-century Pope’s Palace in Avignon ... to intact Roman architecture like the Pont du Gard and the still-used amphitheatre at Arles ... to Montpellier, a vibrant mini-Paris that’s home to Europe’s oldest medical school ... to the fortified city of Carcassonne. People have settled this prosperous area for millennia, and the wars for control rarely quit. Castles dot the landscape; at the peak of our little town, you’ll find a restored watch tower from the 11th century. We're near the coast ... and that coast stretches for 200 miles, from the rugged fjords of Marseille to the picturesque painter's town of Collioure at the foot of the Pyrenees. When there’s no traffic, the warm Mediterranean with its miles of wide beaches (and one of the planet’s largest waterfront nudist colonies, you might be curious to know) is just 20 minutes away. Natural wonders above and below ground. The towering Pyrenees, stretching for 305 miles as the border between France and Spain, are within sight of our town on a clear day. Take the highway there and you’ll soon encounter a whole different, Catalan culture and cuisine. Go the other direction, up to the Causse plateau, and you'll encounter deep-carved gorges reminiscent of the Grand Canyon as well as world-class caves like the 3-star Grotte des Demoiselles. This region is an unsurpassed foodie paradise with Michelin-starred and Michelin-yearning restaurants in abundance. Our little town, by itself, supports two good restuarants you can walk to within minutes. Did we mention the wine-tasting? You’ll be surrounded by countless high-quality, small-volume wine producers who do not export their products. In the US, wines from this region (“pays d’oc”) are widely available at the cheap end of the red range. But the region's real wine-making achievements can only be appreciated in residence. You can even buy rare and interesting local wines in the town's “tabac” (convenience store). Learn more about the region and plan a day trip from Valros. 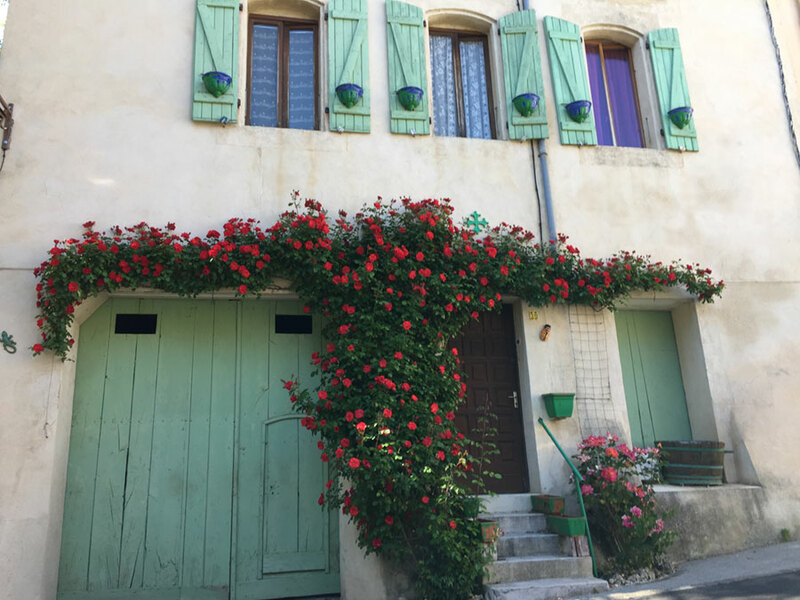 Download Tom and Simone’s very own guides to places to go and things to see in all four directions from your house in France. The Languedoc-Roussillon region of France.